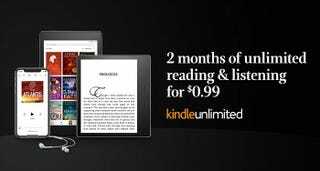 Kindle Unlimited is basically Netflix for ebooks and audiobooks, and Amazon’s offering a rare discount on the service today. You’ll get your first two months for just one measly dollar, after which you’ll be automatically billed the regular $10 per month, unless you cancel. If you love to read, this is a great chance to sample the service without fully committing. The deal is exclusive to new Kindle Unlimited subscribers.